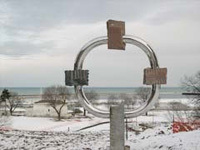 This commission is a % for Art project, resulting from the transformation of the Brady Street Bridge, over Lincoln Blvd. into a bike-path bridge, including the construction of a bike ramp up the ridge to Prospect and Brady Streets. Thus, one may now bike from Brady St. all the way down to the lake shore and park area. 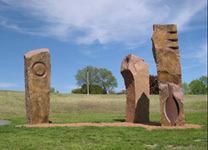 The three monolithic Wausau Rib Mt. 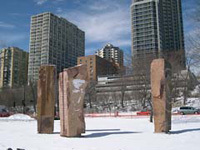 Red granite columns are now installed down on the flat lake-side park area, in the nest of the earthen ramp connecting the street level with the bridge surface level. They were inspired in part by: the ancient Chinese "cong" or "ts'ung tube", symbol of the unity of heaven and earth; by the ancient Egyptian "djed" pillar, which holds up the four corners of the heavens; and by a barn "cider-barrel" door that I saw in Normandy while on a project there. 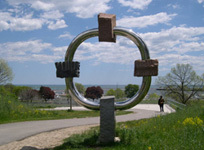 COMPASS is installed on the ridge-top overlooking the lake, composed of mirror polished stainless steel tubes and four different Wisconsin granite blocks. On the base block is engraved a poem by my Mother, Jean Barlow Hudson, which for me, coincidentally as it was written in the 40's before I was born, explains my sculpture. It is inspired in part by the ancient Chinese jade disc called "bi" or "pi", symbol of unity, peace, wholeness and heaven. The square/round aspect of the overall shape is inspired by a Neolithic "bi" in my collection which is this same state, between square and round, i.e. yin/yang together, neither one or the other, hermaphroditic perhaps. 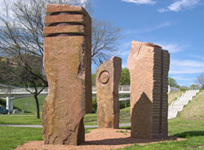 The structural idea was inspired by reading a Lakota Sioux story of the discovery of the four points of the compass, in which each direction was determined by finding a large boulder at that place, led by a small bird. 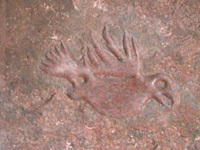 Carved on top of the top-most directional stone is such a bird, taken from the copper cut-out bird from the Mound City Hopewell Indians of Ohio. 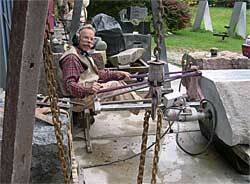 The use of the mirror polish has several goals: to incorporate the color and atmosphere of the environment into the work; reflect the movement of passers-by, and to make the stones float, like my Father did with my Mother in their floating ring trick back in the 40's in Wyoming when he was a professional magician named Bendu.